CHAIRMAN Michael Carter has offered free admission to the rearranged fixture for fans who attended Wakefield Trinity’s abandoned Betfred Super League clash with Widnes Vikings. Trinity were leading 2-0 through a Liam Finn penalty when referee Liam Moore called a halt. Carter had helped Trinity staff and volunteers clear the touchlines of snow before kick-off and Moore and match commissioner David Milburn declared the pitch playable at the scheduled 6.30pm kick-off time. But conditions deteriorated rapidly late in the first half and Moore called the game off in the interests of “player safety” with 27 minutes played. The match is expected to be replayed, with the international weekend in June the most likely date. 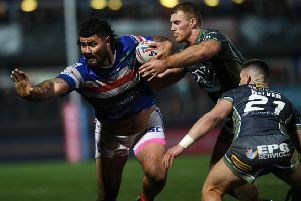 RFL operational rules state that if a match is abandoned before or during half-time, fans who attend the game will be entitled to half-price admission when it is restaged. But Carter said as a “gesture of goodwill”, all supporters who attended Saturday evening’s game and have retained their ticket stub will be offered a free ticket for the new date. The official attendance was 4,002. Trinity coach Chris Chester felt it was the right decision to start the game and also backed it being called off. He said: “We had no issues, I think the match commissioner and the referee made the right call. “We certainly weren’t expecting that amount of snow to all of a sudden come in that last five minutes.